The Ordos 100 projects are challenged to go beyond the individuality of the villa in itself and achieve, in the togetherness of all 100 villas, an urban totality with a coherent sense of whole. The project suggests turning the mat rix of st reets and alleys containing the 100 villas into a recognizable public space with clearly defined spatial and material qualities. OBRA architects envision a hypothetic scenario in which all future vegetation is limited to the interior of private gardens within the individuallot of each villa, while the urban space is, devoid of any greenery, minimally appointed with a hardscape of stone paving and appropriate urban lighting. This would not only reduce costs of maintenance for the public space between villas but also define the experience of moving from public to private as a ritual progression between two dramatically dif ferent environments that are not defined by the uncritical adoption of existing design clichés, but rather defined by conditions suggested by design imagination and the climatic conditions encountered in its desert site. Each villa could be surrounded by a low wall that, while not significantly obstructing the free movement of eyes or bodies through the whole, defines a clearly demarcated field for each plot and a comprehensible structure for the whole in the separation of two concrete conditions – hardscape and greenery – as correspondence between two abstract ones: public and private. The approach of trying to transcend the condition of objectin a field in favor of the holistic activation of the whole defines the design approach for the Villa in Lot Number 16. its construction is proposed as a series of more or less cubic pavilions that orbit around the site’s center of gravity, engaging the periphery of the lot and the allowed maximum height, and trying to bracket as much space in between them as possible. Across this captured distance the volumes will activate the entire site by virtue of suction, parataxis and charged adjacency. The volumes so juxtaposed “look” at each other, charging space with a condition ofinfluence-at-a-distance similar to elect romagnetism, the human gaze, or to Ezra Pound’s imagistideogrammic Method of poetic composition and translation, suggesting the possibility of conveying implied abstract meaning through the vehicle of the physical means which are the destiny of architecture and also the vehicle of its own poetic tension. The resultant action-at-a-distance bends the median spaces of the house, concealing the ends of rooms, washing walls in progressions of chiaroscuro and promoting a kind of dynamism-in-repose founded in the experience of the angular inertia felt when in between curving walls. Action at a distance is also experienced in light cascading down open flights of stairs through the library in the mezzanine between the 2nd and 3rd floors – a proposed addition to the program – or light ricocheting through space as it is reflected between the mirror surface of the swimming pool and the convex planes of the plaster ceilings and walls. The cubic pavilions in the periphery house the bedrooms, spaces to enjoy the freedom from rationality af forded by dream. 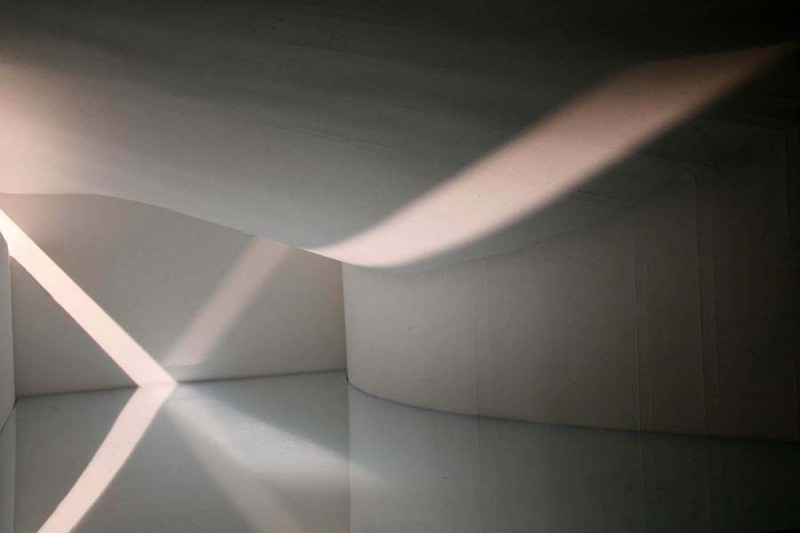 The Study is a special case of such a space, one given to day-dreaming and contemplation, in cont rast to the mediating spaces which are reserved for day use, during the time that the clarity of naturallight can bring life to their curved surfaces. The curving courtyards of the house, defined in the embrace of the median volumes growing out of the center, punctuate the experience of living in the house with a rhythm of interior-exterior of an ABABAB configuration. These spaces are experienced as a series of vigorously formed roofless rooms. Time in the Villa in Lot Number 16 should be spent halfway between inside and outside, inhabiting the pervasive adjacency between rooms and courtyards. Like a hand in a glove interior and exterior belong together by the complementary nature of their geometries, what is concave inside becomes convex outside and vice versa. For example, the East wall of the roof garden above the pool house bends down to allow access from the North Courtyard while creating a meadow that slopes towards the house and away from the predominant wind. In the pool interior this is experienced as a curved ceiling descending upon the water to become a surface of light modulation and reflection. Brick and/or concrete block masonry are ideally suited to the creation of curved walls. 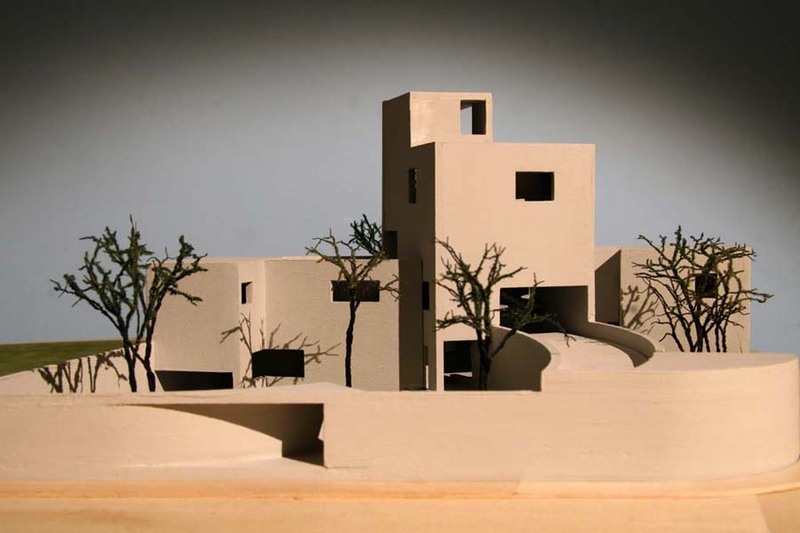 They are proposed with a finish of colored cement stucco on the exterior and colored plaster on the interior to refine their roles in the definition of space and the modulation of light while also subduing excessive tectonic expression. All floor slabs are proposed as reinforced concrete slabs with spans of 8 meters or less, except for one section of the swimming pool which requires a 9 meter long span and can be easily structured with a modestly sized upturned reinforced concrete beam. All interior floors are polished color concrete. R10 floor slabs, R20 basement walls, R40 exterior walls, R60 roof. The mechanical system proposed for the condition of the space relies on geothermal heat pumps providing both heating and cooling for radiant slabs, a heat recovery ventilator to minimize the need for re-heating of already conditioned air and an earth contact pre-heat /pre-cool ventilation duct. All glass should be clear, double insulated and low-e.